A week or so ago, after having to go in and cover one of our summer school general English classes, I wrote a lengthy piece following some reflections on how a much younger version of myself might have handled the material I had to work with. The main drift of my last post was that the way I was trained to teach – the way and many, many others like me were similarly trained – resulted in a tendency to see materials in terms of activities / stages rather than in terms of language to be taught; it relied on a fairly mindless notion of supplementing, one very reliant on photocopied pages of grammar books, games, fun, idioms and overly colloquial lexical items, and – most seriously – it exacerbated the problems of helping students to move from one level to another that are brought about by the way the vast majority of coursebooks are structured and the emphasis THEY place on what students should do to progress. Today what I want to do is to fast forward to the actual lesson I ended up delivering, try to unpick the way I approach these kinds of classes nowadays and consider the ways in which I feel my approach now is more likely to make language stick. Now when I’m planning – and in this instance I had literally five or six minutes to ‘plan’ – I basically copy the material I’ll be teaching and scan through it, looking at the SPEAKING tasks and predicting what might be said during them (I’ll often note down a few whole-sentence utterances on the photocopy), looking at what vocabulary is there and seeing how much attention the material pays to collocation and usage (again, I’ll jot down notes on common usage in the margins, and ready myself to explore things as we get onto them) and just generally making sure I’m on top of the answers and so won’t have to faff around worrying about that, and will thus be slightly freer to actually really focus on what comes out from the students. With my severely annotated photocopy in hand, I rush off and start the class. When covering, one trick I’ve learned to buy myself a few minutes breathing space at the start of the class is to ask students to jot down five things they’ve learned in the last week. They then walk around explaining the items they’ve written and try to elicit them from their various partners. I go round, help out with the explanations, clarify / correct if anyone’s misunderstood what they’ve jotted down, and then get some boardwork up that looks at the language around the language being explained, and that gives me something concrete to round up with. It also gives me a chance to see what kind of language students have been learning and to gauge its utility. In this particular instance, I’d been told by the normal class teacher that the group had been finding the material easy and were maybe an Advanced group. The language they jotted down reflected the way of supplementing with random seemingly ‘high-level’ vocabulary I discussed in my first post. This was a group who, as I realised whilst I sat and chatted with them as they slowly filtered into class in the morning, were clearly nowhere near Advanced. I asked the first student to arrive if she’d ever been to England before and was told Yes, I’ve been in England two years before! This same student then jotted down – among other things – to let the cat out of the back, dog days and to play gooseberry!! And we wonder why students struggle with levels. I rest my case. 1 Look at the images. What aspects of medicine does each one show? 2 Are any of your classmates doctors, or training to be doctors? If yes, what’s his / her specialisation? 3 What skills do you need to be a doctor? Now, my gut feeling on seeing this was that it wouldn’t go far in class: the vast majority of students would answer negatively to the second question, the first seemed fairly obvious and lent itself to one-line responses and the final question necessitated only a few lines more! Part of the problem is that there simply isn’t much to say about these questions. I’d struggle to find more than five minutes to say about them myself, and I have a big mouth! There’s also the fact that they’re asking students to discuss in L2 things they’ve probably never had to discuss in L1, which always seems optimistic to me. Finally, the questions are clearly not written with any sense of what kind of conversations people commonly have around topics like medicine – or even around careers in medicine; rather, they’re sort of pseudo-intellectual, perhaps designed to do what a sales rep might claim is develop ‘critical thinking’ or foster visual literacy or some such spurious skills! Given that I suspect this might not generate much speaking, I simply set the thing up by telling students to read through the questions and to look at the pictures, to ask if there’s anything they’re not sure of and then to chat in pairs. I monitor, listen in, help out and after maybe four or five minutes say Stop there! Let’s look at how to say some of the things you were trying to say better! 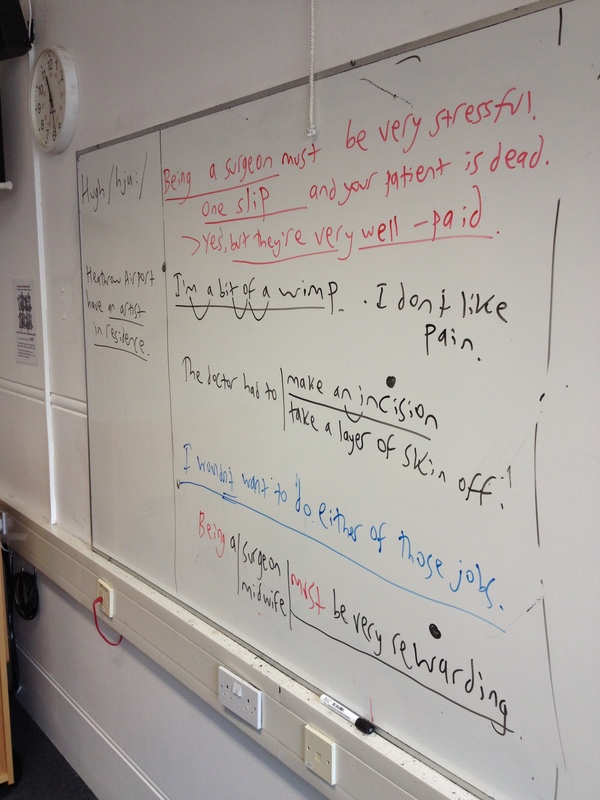 Here’s what I wrote on the board – and note that – vitally, I feel – all this was got onto the board WHILE STUDENTS WERE TALKING, as this means we cut seamlessly from student speaking time into a focus on new language / better ways of expressing yourself. Sometimes, what I end up with on the board, gapped, will all be based on what students themselves have actually tried to say; in this particular instance, only three things were. For question 1, I heard one student say People now look more to the Internet for to find information about their health, which resulted in me writing up More and more people are t………… to the Internet in ………….. of medical advice; another pair were talking abut the pictures and clearly didn’t know the word paeditrician – but still got by on mutual understanding and the use of visuals – so I wrote up My sister is a p………………. ; and finally for question 3, one students said doctors need to be sure to make nervous people not nervous, resulting in Doctors need to ……………….. to s……….. people’s nerves. The other sentences I just added in myself as examples of things I could’ve heard, or would’ve maybe said myself if I’d been answering the questions. OK, so some of you were talking about the first picture and saying it shows the way people nowadays are more likely to use the Internet to look for advice or information about their illnesses – and be careful Italian and Spanish speakers, advice and information are uncountable in English, so it’s NOT advices and informations. So yeah, you said that more and more people are starting to look at the Internet, they’re moving away from doctors and books and they’re going to the Internet, so they’re? Anyone? No? They’re turning to the Internet because they’re looking for information, so they’re in? Yeah, that’s right. In search of advice. OK, in the second picture, you were talking about this kind of doctor, a doctor who specializes in working with kids. This kind of doctor is called a? Anyone? Yeah, OK, that must be the Spanish for it. It’s very similar in English. 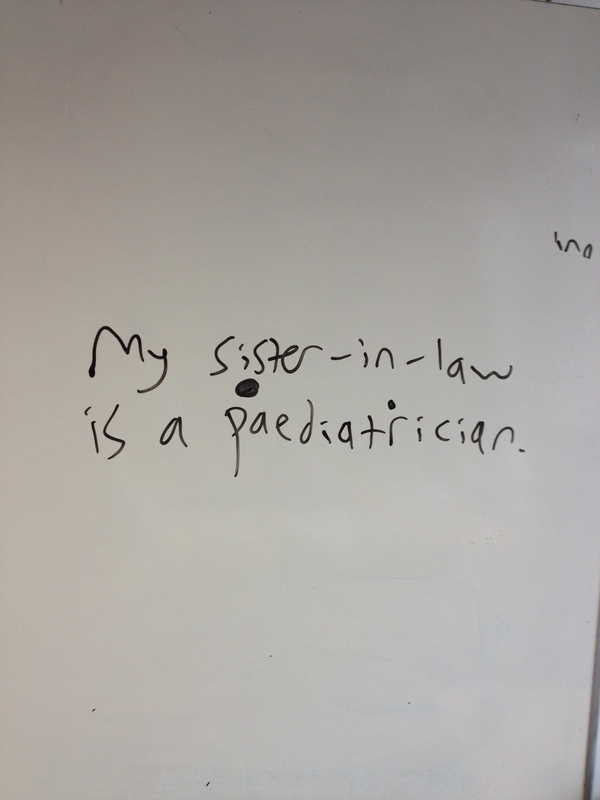 It’s a paediatrician. Where’s the stress? Yeah, the main stress is on the /pi:/ and then there’s a second stress on the /trI/, so everyone paediatrician. Again. Good. And in this picture, someone was saying maybe the little boy is just going to have his body looked at, to make sure he’s in good condition, so he’s going for? That’s right. A check-up. And if you have one every year it’s an? Yeah, an annual check-up. And notice – you HAVE an annual check-up. In the third picture, you were saying the doctors are getting training, right? You can also say it like this – We GET trained up / They’ll train us up ON THE JOB. It’s the same meaning. And what about the fourth picture? Yeah, it looks like some kind of traditional healer, like a traditional doctor, or something, doesn’t it? I don’t think any of you said Yes for the second one, did you? Nope. OK. So the third one, the qualities that doctors need. Some of you were saying doctors need to be good with their hands, especially if they’re like surgeons or whatever, as if they slip, it can be disastrous, so they need to have a? No, not stable hand. Stable is usually used to describe the economic situation, or like a stable relationship with someone or if someone’s very ill in hospital, but isn’t going to die, they often say they’re in a critical but stable condition, so not stable here. usually Yeah, a STEADY hand. Good. And you were saying they need to be able to see blood. You know, some people if they see blood, they can’t stand it, they faint or maybe throw up, but doctor’s need to have a? Yeah, a strong what? No-one? A strong stomach. Someone was also saying doctors need to be good at talking to you when you’re ill and lying there in bed, they need to be good at talking to you and making you feel things are OK. They have a nice relaxing manner, they have a good? Yeah, manner is the second word. And the first one? No-one? a nice or a good bedside manner. Finally, you were saying that they need to be good at making nervous people feel better, so they need to be? Yeah. be able to what? No, not solve. Or sort out. Usually you solve or sort out problems, but you soothe people’s nerves. In the same way, you can talk about soothing music or soothing colours. And after all that, here’s what we ended up with on the board. There are many advantages to doing thins this way. Firstly, it doesn’t really matter if the speaking takes off or not. In a sense, the students aren’t speaking for the sake of speaking; they’re speaking partly to lead them in to the rest of the spread, partly to practise, but also partly to lead in to input, so there’s a language-based focus to what they attempt; using the whole class to elicit the missing words allows the truly strong students – and not just the chatty ones who love the sounds of their own voices – the chance to show what they know and to have their learning recognized and validated; everyone feels that there must’ve been plenty going on the class if this is what the round-up is like and thus, by extension, other students must be pretty good . . . and finally, old language gets revisited, new language gets fed in, and students get primed further in their understanding of how words work with other words. Next came the listening. The first task asked students to listen to an interview with Laura, a Mexican doctor, as she talks about her medical career. Students had to number the four ‘big pictures’ according to the order she talked about them.This seemed easy to the point of being banal to me, and given that the second task included in the book – listening again and ticking the topics she mentioned: her home life and family, her medical training and specialisation, the role of traditional healers in the community, the most common illnesses that she treats, changes in the information patients can access nowadays, and her favourite and least favourite aspects of being a doctor, was also essentially a gist task, I put these two together and told the students to listen, find out which pictures they heard mentioned in which order AND to listen for which topics she talked about – and what she said about them. After playing the CD once, students compared ideas in pairs and I then elicited ideas from the whole class. I’m going to do a whole other post sometime son abut what teachers do when they round-up after first listenings, but I think the main point is that checking the answers is never enough; there has to also be some collective attempt to establish why the answers were the answers – what the students heard that helped that get the right answers (those who did!). In a sense, what now occurred was a kind of teacher-directed / filtered collective retelling. We clarified that first she talked her BASIC TRAINING, when she GOT TRAINED UP; then she talked about the year she spent in a REMOTE VILLAGE, where plenty of local people PUT MORE FAITH IN traditional healers than in modern doctors; she then returned to Mexico City, where she SPECIALIZED AS A PAEDIATRICIAN. Finally, she talked about the number of people TURNING TO the Internet for advice and coming to her SURGERY ARMED WITH loads of info. We then went through which topics she’d been talking about, and what they’d heard about each one, with me winkling out – or adding in – exact language she’d used about each topic, correcting – and rejecting – student ideas where necessary and writing up a few bits and bobs that emerged from this. I neglected to photograph the board at this stage, so can’t be sure of what ended up there, sadly. Next, before the second listening, I told students to discuss in pairs whether they thought the 6 sentences below were true or false – and why. I didn’t really check ideas at this stage – simply said they should listen once more and check their ideas, and try to find out what the speakers said that showed the sentences were true or false. 1 Laura decided to become a doctor mainly because she liked Science subjects at school. 2 To qualify as a paediatrician, she did a four-year degree, a year of social service and a year of residency. 3 She did her social service in an isolated rural area. 4 Local people used the clinic a lot when they had medical problems. 5 She’s against the use of traditional medicine. 6 The parents of her patients often think they know more about the problem than she does. 1 She was always good ……. Science subjects. 2 On …….. of all that, she then did a four-year s……….. to train as a paediatrician. 3 It was very isolated, very r………….. – very ……… off from the rest of the country. 4 Most people o…………….. for the traditional healer first. 5 She’s not ……………………. to it, especially if it’s used in c……………. with other forms of medicine. 6 She doesn’t say this directly, but she i……………. it. Right, so number 1. True or false. yes, true. Why? yeah, OK, so when she was at school, she was always good MMM Science subjects. Not IN. GOOD AT. OK, and number two. yeah, it’s false, because FIRST she did a four-year degree, a year of social service and a year of residency. Then, in addition, as well as that, she did four more years, so ON? Yeah, ON TOP OF ALL THAT, she did a four-year? No-one? A four-year period of time working, so a four-year STINT. We can talk about people DOING A STINT IN THE ARMY or DOING A BRIEF STINT AS A WAITER IN NEW YORK. And 3? Yes, it’s true. She said the area was very isolated. How do you pronounce it again? No, not isoLAted. Listen Isolated. Everyojne. Again, Good. So, it was very isolated, very? Yeah, remote. Where’s the stress. Good. reMOTE. Which means it was very MMM off from the rest of the country? No, not broken off. Anyone? Cut off. And so on. Again, what this does is move beyond just ‘doing a listening’ for the sake of ‘doing a listening’ and recognizes that the main factor that affects listening ‘skills’ is knowledge of the language. It turns the listening in on itself and focuses the class on the actual words used to convey the meanings they’ve been processing. And again it ensures students get the chance to show what they know, and if they DON’T know, they get the chance to learn something new, in context, with meanings clear, and with co-text made clear. 1 a Look at transcript 2.2 on page 162. Which of these words can you find? I decided to skip the part where students had to find these words and instead simply moved on to exercise B, where students had to discuss the difference between the pairs of words. I gave them five or six minutes to compare ideas in pairs, went round and listened in and helped out, and used this time to get my boardwork up. At this juncture, I should make it clear that I really hate these kinds of exercises. They covertly encourage a single-word focus, they are written wit little thought to how students’ communicative competence will develop as a result of doing them, they are hard to know what to do with in the classroom for most inexperienced teachers and even if meanings are successfully tackled (and they’re often NOT for the desire to be ‘student-centred’ kinds of reasons I explained last post around! ), then students glean little or nothing about how to actually use these words themselves. If I have to do these kinds of exercises, it’s the last issue that I try to make my main focus: fine, tackle meanings and ensure that’s clear, but above and beyond that, ensure that usage is clarified and exemplified. OK, so what’s the difference between a paediatrician and a paramedic? Well, we’ve talked already about paediatricians, haven’t we? They’re doctors that specialise in kids, they work mainly with babies. And a paramedic? yeah, OK. a bit like a travelling doctor, yeah. They’re like doctors trained to give care to people at the scene of an accident, so they often travel inside ambulances, they’re part of the ambulance team of people, so part of the ambulance? yeah, good. CREW (write this in to the gap). And patient and surgeon? Yeah, right, so the patient is the person who’s receiving the medical treatment, while the surgeon is a special kind of doctor who – not DOES operations, but – anyone? Yeah, performs (write in gap on board). And three different kind of surgeons. OK, yes, heart and brain. OK. Yes, can also have neuro-surgeons. I forgot about that one. Surgeons who deal with the nervous system, yeah. And? The ones who do like correction or reconstruction of various parts of the body? Yes, plastic surgeons. (I wrote all these up as I was eliciting). OK. Next. Nurses you’ve all already talked about, but midwives? Right, they’re nurses who look after women when they’re having babies, so they MMM babies? Anyone? No. Deliver (write it up), yeah, that’s right. Like for letters. The same verb! Sorry, what was your question. Can men be midwives? Yeah, of course they can. It’s not very common, but it happens. No, they’re not called mid-husbands, but I can see your logic there. I guess they’re just called male midwives. They’re can’t be that many, though. So what about ward and operating theatre? No? Well, a ward is one particular part of the hospital, so when women are giving birth they go to the? No, not the mother’s ward. Anyone? The maternity ward (wrote this up). And you also have – if people have severe mental health problems, maybe they go to the? Not psychiatrist ward. They might to SEE a psychiatrist, but they go to the psychiatric ward. And old people sometimes go to? No? The geriatric ward. And the verb? When you arrive at hospital and they say Hi and sent you to these wards, you are? Yeah, that’s right. Admitted to a ward. (wrote all this up). An the operating theatre? It’s where the surgeon performs the operations. And if someone is taken into hospital and very quickly taken to the operating theatre, we often say they were MMM to it. No, not run – rushed to the operating theatre (which I then wrote up). OK, so what about bandage and plaster? Right. A bandage is a thin piece of cloth that you wrap round a part of your body that’s hurt or injured, so maybe after you get a tattoo you have to wear a bandage over it, and like some people wear bandages for support when they’re jogging, round their knee joints or whatever. And plaster . . . plaster has two meanings. One is when you cut yourself – like a small cut – you have to put a plaster on. Yeah, Band-Aid is the same. It’s just the brand name. It’s more common in American English, but I know what you mean. And if you break your arm or your leg, you have to have it IN PLASTER for a few weeks. Like here, in this example (pointed to the board). And finally, self-diagnosis, like you said it’s when you decide yourself what you think is wrong with you, maybe after reading about the symptoms on the Internet, and self-medication? Yeah, it’s when you give yourself – or order for yourself – the medicine you think you need, so you bypass the doctor. Increasingly now, you can order what used to be prescription-only drugs online. And the verbs from these nouns? Right. Self-diagnose and self-medicate (which I wrote up) people sometimes say you self-medicate if you drink really heavily or take LOTS of drugs, like you’re trying to calm your brain or control you mind or whatever with these ‘medicines’. OK. Anything from here you’re not sure of? No? Right. I’ll give you a minute or two to copy down the boardwork. Work in pairs. Discuss the questions. – Are you a good patient? Why/Why not? – Which would you prefer to be, a midwife or a surgeon? Why? – What are the advantages and disadvantages of self-diagnosis and self-medication? OK, for example, for me . . . I’m a pretty bad patient. I really hate going to the doctor’s or dentist’s and try to PUT IT OFF for as long as possible. I mean, I’ll only go for a check-up if I absolutely have to. I don’t like having injections, I don’t like people prodding and poking me (which I acted out whilst saying them), I don’t like the smell of hospitals. Basically, I’m maybe fairly typical in that I’ll avoid being a patient unless it’s really urgent. Now you guys try. Two, two, two, two, three. 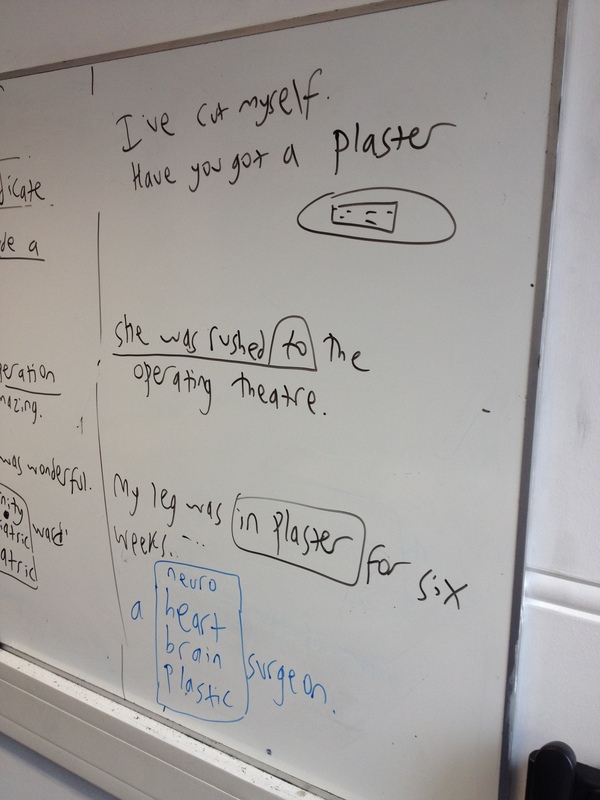 Students then chatted in pairs / groups and I went round, asking questions, chipping in, correcting pron errors, pointing out small grammar slips and – crucially, I’d argue (and have many times before, I know!) 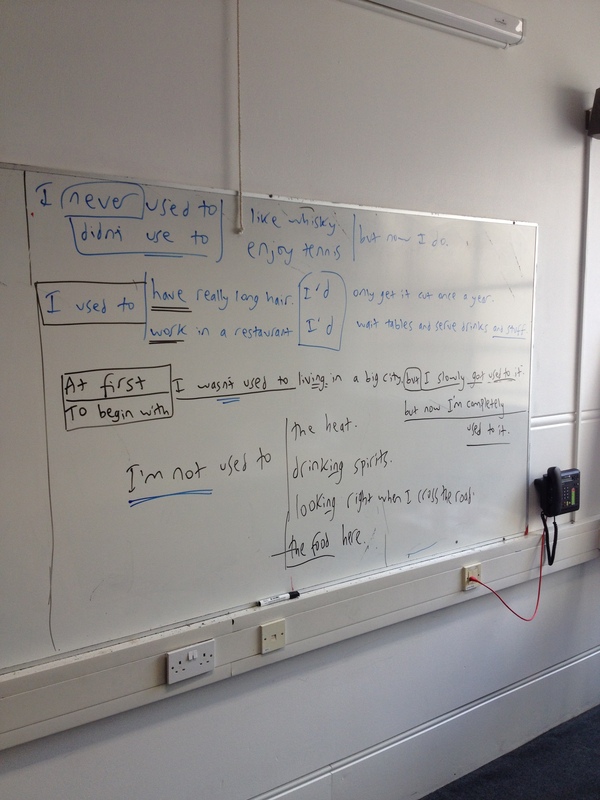 – getting gapped sentences up on the board so that after five or six minutes I could stop the group and say we were going to look at how to say some of the things they were trying to say in better English. You can see the boardwork we ended up with following this section below. The words I chose to gap – though I’d usually give the first letter, and would sometimes add in the second if students were struggling – were being, slip and well-paid in the first example; wimp, incision and layer in the next couple. The sentence that followed cast an interesting light on level in itself. Whilst my younger self may well have felt the speed at which the class raced through the material was a sign of their being a higher level than the book, my current self is far more attuned to student output and the many, many glitches within it. 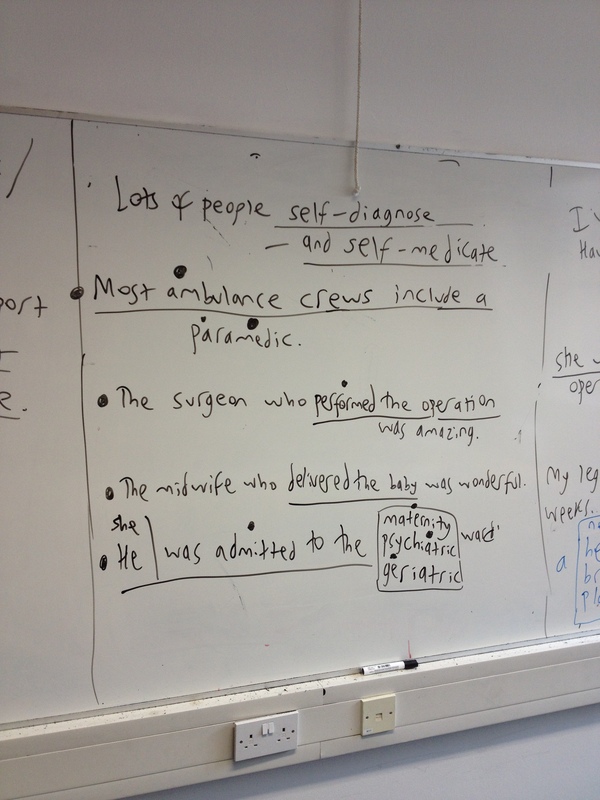 The sentence follows stemmed from a student discussing surgeon or midwife and saying I don’t want both of jobs! The words I gapped here were wouldn’t and either – which I (eventually!) managed to elicit, and which resulted in a brief discussion of the sentence being hypothetical or imaginary and a reminder that not . . . either means not this one or that one. Finally, I recycled rewarding, which was successfully elicited. Next we were onto the dread grammar. As I stated in my first post on this lesson, for me any book that is stupid enough to lump be used to, get used to and used to all together does not deserve to be ordered, but needs must in this particular instance. 1A Work in pairs. Read sentences a-d. Underline all the examples of used to. a I used to work as an assistant to a paramedic. b I wasn’t used to living in such a small community. c In the beginning it was frustrating, but now I’m getting used to it. d Doctors are more used to dealing with this situation these days. 1 Which sentences talk about a) the present? b) the past? 2 Which sentences talk about a) a past habit, state or situation? b) a situation that is becoming normal? c) a situation that was strange or unfamiliar in the past? So which ones are about the past? OK, yes. A – I used to work as an assistant. In the past I worked as an assistant, but now I don’t. And? Yeah, B. When Laura first moved that remote village – in the past – she WASNT USED TO livING in such a small community, but then it became normal for her, she GOT USED TO it. And which are about the present? Yep. C – At first, Laura found it frustrating when patients came to see her armed with loads of info from Wikipedia, but now it’s becoming more normal for her, she’S GETTING USED TO it. And D, yeah. Doctors today find this fairly normal, they ARE more USED TO dealING with it. OK. And which one is past habit or state or situation? Yeah, A. This was her work state in the past, but not now. We also often use another structure in conjunction with USED TO as well, like in this example here. I used to have really long hair. I MMM only get it cut once or twice a year. Any ideas? No, not COULD. That’s more for ability. No-one? I’d – I would. Here’s another example: I used to work in a restaurant. I’d wait tables and serve drinks and stuff. So we use USED TO to introduce the story and then give details of common past actions / habits using WOULD. Right. A situation which is becoming normal? Yeah, C. In the beginning, patients coming to her with loads of info from the web was annoying, frustrating, but now it’s becoming normal. She’S GETTING USED TO it. OK. And c? yeah, the one about how she WASN’T USED TO livING in a small community. It was weird for her and IT TOOK A WHILE FOR HER TO GET USED TO it. OK, let’s move on and do a quick practice of making the form, then we’ll do some talking, OK? We use used to + the …………… to talk about situations, habits or repeated actions in the past. often they are things which we no longer do. + I ……………. to live in Paris. – I didn’t use to speak French.
? Did you ……….. to eat out a lot? I was about to move onto the practice, but quickly asked if anyone had any problems – and at this juncture, one student asked one of the classic Grammar Anxiety questions these kinds of exercises seem to promote: “I’m still not sure of the difference between not being used to doing something, getting used to doing and being used to doing!” I pointed out they were often part of a process – the change from things feeling weird to things becoming normal slowly to then being totally normal, and there were common time phrases used with them. 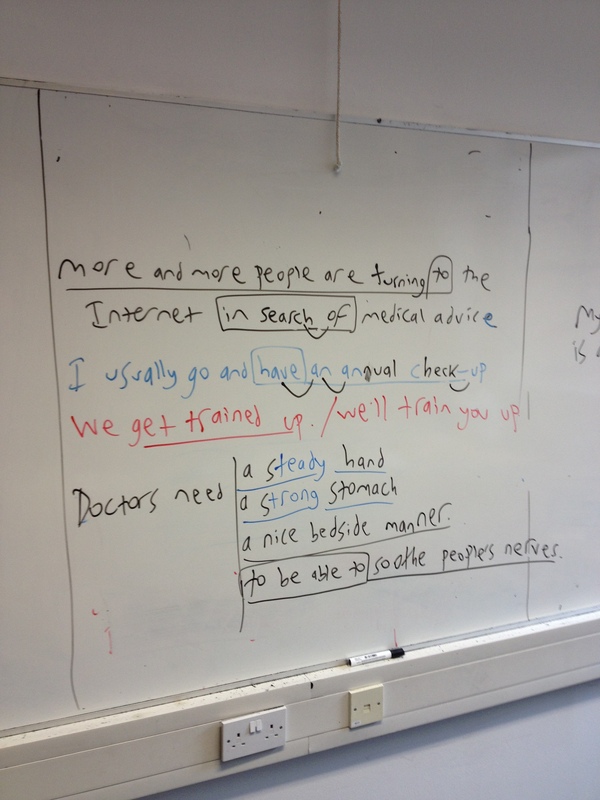 I wrote up on the board: AT FIRST / TO BEGIN WITH, I WASN’T USED TO LIVING IN A BIG CITY, BUT NOW I’M USED TO IT / BUT I’M SLOWLY GETTING USED TO IT – and explained this may be similar to this particular student’s own experience of moving to London – from a small town in Japan – and asked which of the two possible asnwers best described his feelings now. 1 something you used to believe as a child. 2 something you’re getting used to, but it’s still difficult. 3 something you’ll never get used to. 4 something you weren’t used to at one time, but now it’s fine. 5 something you’ve slowly got used to over the years. I gave students a minute or two to read through and gather thoughts, then gave my own model answer which took in slowly getting used to having grey hair, after a few years in my mid-30s of dyeing it; how when I was a kid I used to believe that the tress from the graveyard I grew up opposite had dead people’s fingers in them and that when the wind brushed them against my window, it meant they wanted to get in – and get me; and how years ago when I first started eating Japanese food, I wasn’t used to natto – fermented soya bean – but now I love it. Students then chatted a bit – struggling with most questions after 1, in all honesty, as it’s often hard to come up with these things on the spur of the moment – and some great stories emerged about how one student used to believe there were ghosts behind the curtain, another used to believe that if she stepped on money dead soldiers would come in the night and rip her fingers off, and so on! There then followed some reformulation, some retelling and much laughter and banter. This was one of the boards we ended up with, but I seem to also recall some other bits and bobs emerging that I forgot to take snaps of. You get the gist though. So there you have it. How I survived my morning of cover; how I’ve changed in the way I push the material that’s available to me and how I insist on a whole-language focus; how I try to compensate for coursebook’s relentless single-word focus; how I use the board to ensure students go away with plenty of new – and reworked – language noted down and available for them to revise from; and how upping the level to me now means NOT supplementing, but digging deeper, working language and asking questions. Not the best material I’ve ever used by any stretch of the imagination, nor the best lesson I’ve ever done, BUT one from which students went away having learned new language and having shown they’d remember plenty of previously taught language; having done lots of speaking and feeling that they’d been pushed. Not one complaint about level ensued – and there was not a single idiom in sight! Thank you for so many very, very practical ideas! A great illustration of what teaching lexically really is. I’m going to ‘borrow’ some of your ideas, if you don’t mind 🙂 Starting with the review at the beginning of your class. I do a lot of reviewing and recycling with students myself, but I’ve never actually done in this particular way. And it really gives you an excellent opportunity to observe the students right at the beginning of a class. What I’m wondering about is this – with this kind of very rich input, how much of it would you realistically expect to ‘stick’? Thank YOU for taking the time to read and comment, Monika. I’d been starting to feel like I was talking to myself for a while back there!!!!! Feel free to take whatever you feel might be useful from what I’ve written. In terms of how much sticks, well, the first thing to say is that more will stick this way around than in the way I used to teach, quite simply because I’,m doing way more to illustrate the language and to involve students in it; there’s more discussion around the language, more mini-personalisations, more invested in the language. There’s also much more of a culture of encouraging students to demonstrate previous learning, and a more conscious attempt on my part to be constantly recycling and going over stuff we’ve touched on before. Obviously, I’m not mad enough to believe all students will remember everything, but I know from years of doing things this way, that SOME students WILL learn and remember a large chunk of what I give them; others will learn some, and some will just learn the bare bones. The advantage of input-richness is that you allow students to take responsibility for how much they then try to learn. In an input-poor class, you’re ensuring they all learn, but you’re totally limiting the amount they’re able to learn, and are thus holding the stronger students back and frustrating them at every turn. Leading them to come and complain that they’re in the wrong level, ultimately! yes, I totally agree. It shifts the responsibility for learning to the students – now it’s more up to them how much of it they’ll learn from what they’ve been given. And with mixed ability classes (which is a frequent situation in my teaching context), oferring them rich input is the best solution. Another good aspect of what you’ve described that I particularly appreciate is connected with not giving in ‘blindly’ to what the coursebook offers, but just using the coursebook as a tool. In a way, older coursebooks (I’m thinking here of such ‘old’ books as L.G. Alexander’s series. I’m not sure whether anybody still remembers it, but I learnt English from it, and it was the first coursebook I used as a teacher, so I’m a bit nostalgic about it, perhaps. Without any supplementary material, ‘poorer’ in a way, they encouraged teacher independence and resourcefulness in the classroom more than these more recent ones. Yes, this approach has very much come out of teaching mixed-level classes, Monika. In all honesty, I think pretty much ALL classes are basically mixed level, though, when it comes down to it, especially in terms of how much lexis they know. This approach both allows the strong to feed the weak in class, all filtered through the pro-active teacher, and yet also gives the strong the challenge of trying to learn as much of the input as possible (whilst giving the weaker ones plenty of support / scaffolding and recycling). It terms of “not giving in blindly to the coursebook” in a sense, this was born out of necessity as I simply didn’t feel the book in this case gave enough input / expansion / support / challenge – and didn’t pay enough attention to usage. With our own books, I hope we offer teachers more of this, so they need to do less, but I do still expand in the same way whatever material I’m using. At the same time, though, I was basically just teaching from 1-10 and working my way through what was there, so it’s not like I was adding loads of supplementary material or anything like that. It’s more just adding more language to bolster what was provided. Thank you for the clarification. I completely agree on the mixed ability issue. Thanks for the kind words, Monika. Innovations Advanced does seem to have been one of our more popular works. Some folk have found it TOO lexically challenging on occasion, but I’ve always thought that at this level, it’s precisely what students really need to push them properly onwards! I think we saw it really as a kind of CAE / CPE hybrid when writing it, which explains the challenge it presents! Anyway, great to know you and your students like it. I liked this blog, Hugh so I have joined up for more! Your white board pictures reminded me of what my whiteboards used to look like. I like to branch out and develop wider vocabs while refining what students already know. I think the breather idea is good and one I used too especially when I taught nursing students on a Monday and Wednesday only. By the time I returned the next Monday, well, a lot of the knowledge had gone. It’s a good opportunity to link last week’s words to this week’s vocab too. And a good way to get everyone energised for the coming session too. There’s plenty of back posts that you may find worth ploughing through!